Background Cost–benefit analyses have been proposed for determining acceptable risk of injury regarding training and competition participation. Currently, there is no best evidence synthesis of the literature evaluating the relationship between injury/illness and chance of success or failure. Objective To evaluate the relationship between injury and/or illness and success and/or failure in athletic populations (individual and team sports). Methods This review was prospectively registered (PROSPERO CRD42016036729) and a systematic electronic search was conducted in May 2016. Inclusion criterion was any study design describing the association between injury and/or illness and success or failure in athletic performance. Two independent authors screened search results, performed data extraction and assessed methodological quality and strength of evidence using a modified Downs and Black appraisal tool and a modified van Tulder method, respectively. Results Of 10 546 titles identified, 14 satisfied the inclusion criteria and 7 had low risk of bias. Outcome measures associated with success and/or failure included: (1) availability of team members, (2) injury incidence, (3) injury burden, (4) squad utilisation and (5, 6) precompetition and in-competition injury. There was strong evidence that (1) increased availability of team members/athletes decreased the risk of failure and (2) precompetition and in-competition injuries were associated with increased risk of failure. Conclusions Injuries have a detrimental impact on team and individual athletic success. Increased player availability improves chances of success. Conversely, injuries sustained both prior to and during competition may increase risk of failure. Injury prevention should therefore be a priority for maximising athletic performance. The role of health with regard to athletic performance has been popularised by recent publications.1–3 Exposure to injury risk is inherent in participation in sport4 and calculated risks inform daily decision making. Recently, the training–injury prevention paradox,5 highlighting the finding that training load can both prevent and expose athletes to risk of injury, has been extended to describe the use of cost–benefit analyses.6 In these analyses, potential risks are measured against the potential reward. For instance, the benefit of improved fitness following intensified training was measured against the increased risk of sustaining an injury due to an acute spike in training load. What is missing from this debate is detailed understanding of the costs that injuries and illnesses impose on performance. Success and failure may be driven by many inter-related systems, including the athlete’s psychological and physical health, athlete–coach relationship and technical, tactical and/or physical attributes.7 In this review, we focus on the relationship between the athlete’s health and success/failure. The aim of this review was to systematically search, appraise and synthesise the level, strength and quality of evidence pertaining to the cost of injuries and/or illnesses on the success of both team and individual athletes. Summarise the impact of injury and illness on athlete and team performance. Provide level 1 evidence to inform policy decisions regarding resource prioritisation, cost–benefit analyses, staff recruitment and retention and pedagogy for training of personnel. Promote shared decision making among key stakeholders working within an integrated performance system8 for the individual and team level. The impact of injuries and illnesses can then be discussed beyond their financial costs. The Preferred Reporting Items for Systematic Reviews and Meta-analyses (PRISMA) guidelines9 were followed and the protocol was registered on the PROSPERO International prospective register for systematic reviews website (http://www.crd.york.ac.uk/PROSPERO) on 21 March 2016 (registration number: CRD42016036729). 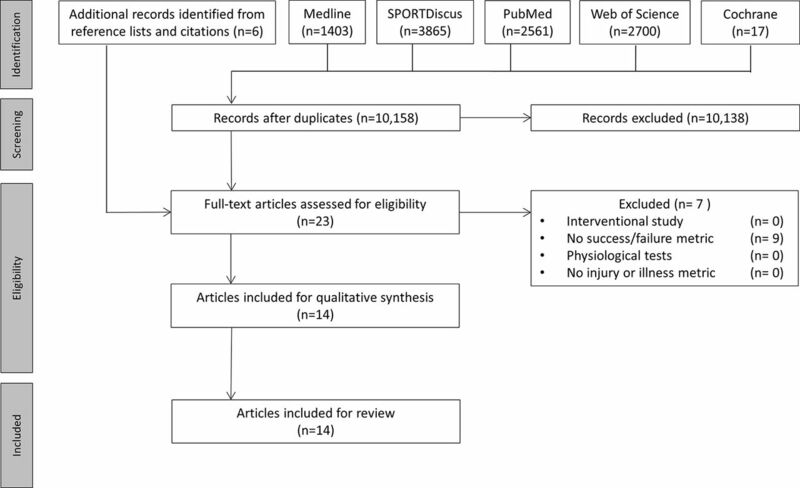 Additionally, this review referred to the BJSM systematic review methodological elements recommendations10 and used the Assessing the Methodological Quality of Systematic Reviews (AMSTAR) tool11 prior to publication to ensure accurate reporting. Inclusion criteria were: (1) any study design, (2) investigation of the association and/or predictions between sustaining injury and/or illness and the effect on competition success and/or failure in athletes or teams and (3) comparison with athletes and/or teams that did not sustain an injury or illness and the effect on competition success and/or failure. All sexes, ages, types and levels of sport (professional/elite, subelite, amateur) were considered eligible. Populations were considered athletic if they participated in any sport listed under the MESH heading ‘sports’. Exclusion criteria were: (1) the study did not report success or failure, (2) physiological studies where injuries or illnesses were not reported, (3) studies which assessed the performance of a test such as a time trial or laboratory test rather than a performance outcome such as winning or losing an event or competition and (4) studies investigating the outcome of an intervention such as surgery. achieving a high subjective rating by an appropriate authority, for example, coach score. Failure was defined as not achieving any of the success criteria. A comprehensive, electronic search of the literature without date restrictions in Medline, PubMed, Sport Discus, Web of Science and Cochrane was conducted on 10 May 2016. Various combinations of the following keywords were used and adapted for each database: ‘athlete’, ‘sport’, ‘team sport’, ‘injury’, ‘illness’, ‘success’, ‘team success’, ‘win’, ‘failure’, ‘loss’ and ‘lose’. All potential references were imported into Endnote X7 (Thomson Reuters, Carlsbad, California, USA) and duplicates removed. Titles and abstracts were independently screened for eligibility by two authors (PC and MD). The full text of each eligible published study was then independently examined according to the inclusion criteria and reference lists were then manually searched to identify further potential articles for inclusion. Citation tracking was also used to identify potential studies for inclusion. A search strategy is provided in online supplementary material 1. Two reviewers (PC and BR) independently conducted a risk of bias assessment on each included article using the Downs and Black checklist (see online supplementary material 2). This checklist is reliable,12 and modified versions of the scale have been used in previous reviews.13 14 This checklist assigned a methodological quality score for each study with a maximum possible score of 29. A score of ≥75% was deemed to be high quality, 60%–75% moderate quality and ≤60% low quality.14 Any discrepancies between initial ratings of quality assessment were discussed between the two reviewers (PC and BR). A third reviewer (MD) was consulted if required to reach consensus in the event of continued disagreement between results. Data from included studies were independently extracted and collated by two reviewers (PC and MD). Extracted details from all studies included author(s), year of publication, study design (mapped to the level of evidence), demographics (age, sport, level of competition, number of athletes, total team/individual seasons included), definition of success and/or failure, definition of an injury and/or illness (mapped to the Injury Definitions Concept Framework (IDCF) classifications),15 main statistical methodology and key findings relating to the relationship between injuries and/or illnesses and success and/or failure. Results were categorised, where possible, according to homogenous definitions and cohort characteristics of success and failure to assist with synthesis of findings. Results were considered for meta-analysis where the risk of bias was low,10 the definitions of success were equivocal and statistical methodology allowed for pooling of the data. A previously published16 adaptation of the level of evidence based on van Tulder method17 and Reurink et al 18 was used. The strength of evidence was defined as: strong, ‘consistently identified in two or more studies, and greater than or equal to 75% of all contributing findings’; moderate, ‘consistently identified in two or more studies, and greater than 50% of all contributing findings’; limited, ‘identified in one study, with greater than 50% of all contributing findings’ and conflicting, ‘inconsistency in two or more studies’. Where half of all contributing sources were in agreement, with the other half conflicting, a potential direction was indicated; no evidence, ‘no change in subjective or objective measures’. The electronic search identified 10 546 records, and following removal of duplicates, the titles and abstracts of 10 158 articles were screened. Five articles were added following citation tracking and eight added after manual reference checks. The full text of 23 articles was retrieved and assessed for eligibility against the inclusion criteria by two authors (PC and MD). After reviewing the full text of 20 articles, 9 articles were excluded and the remaining 14 articles were included for full review and data synthesis (figure 1). The third reviewer was not required to determine the eligibility of any studies. Flow chart of the selection process for inclusion in the systematic review. Two reviewers (PC and BR) initially disagreed regarding 25.7% of the items. Any items where disagreement was apparent were discussed and consensus was reached. A third reviewer was required to reach consensus for five items (1.3%). The methodological quality scores for included studies ranged from 18 (62.1%) to 24 (82.8%) with a maximum possible score of 29. The Downs and Black checklist scores (expressed as a percentage) are reported in table 1. Individual scores for each criterion are presented in online supplementary material 2. The magnitude, direction and strength of evidence for the relationship between injuries and/or illness on the success and failure outcomes are presented in table 1. All extracted data are presented in online supplementary material 3. The majority of studies included in this review evaluated the impact of injuries and/or illnesses on team performance (n=12, 86%) with half of these studies evaluating this relationship in football (n=6).2 21–25 A variety of variables relating to injury/illness were evaluated and these included: player availability, injury incidence and burden, precompetition and in-competition injury and squad utilisation. Of the 14 studies investigated, only two studies1 26 reported the effect of illness on success and failure outcomes, with the remaining included studies evaluating the effect of injury alone. Synthesising the available evidence, four main findings are presented in relation to the definition of success or failure. Based on three studies with low risk of bias, lower player availability1 2 26 was associated with higher chance of failure. A total of three studies, one with low risk1 and two studies with moderate risk of bias,29 30 provided evidence for higher chance of failure if an athlete had sustained a precompetition injury. Three studies, two moderate24 25 and one low risk of bias,27 indicated that in-competition injuries were associated with a high chance of failure. There was an association between injury incidence and burden and reduced chance of success derived from four studies, three with low1 3 21 and one with moderate risk of bias.23 The largest proportion of evidence (36% of the included studies investigating all definitions of success and failure) was from elite football (soccer) populations. There was strong evidence with low2 21 or moderate22–25 risk of bias supporting the relationship between injury and failure in football, independent of how failure was quantified. There was conflicting evidence for the relationship between injury and success in taekwondo. There was a strong relationship reported in one study with low risk of bias27 and no relationship reported in the remaining study with moderate risk of bias.29 Synthesis of evidence was not indicated for any other populations given only one study was included for each of the sports: track and field, rugby union, rugby league and ice hockey. This review provides level 1 prognostic evidence19 supporting the commonly accepted view that injury and/or illness can impact sporting success as defined operationally in the methods box. This has real-world implications. Injuries sustained both during the preparation period and during competition significantly hamper overall success throughout the season. Furthermore, the availability of an athlete to train or compete is associated with the outcome of the event. This systematic review provides a balanced argument for the cost analyses of training and competition participation.6 The results highlight that coaches, practitioners and policy makers should investigate the role of injury and illness on performance. Within many sporting contexts, the preseason/precompetition period is viewed as a time when increased risks are acceptable. However, completion of preseason training without injury potentially has a protective effect against training load errors such as large spikes in training,32 which expose athletes to increased risk of injury during the competition period. This review demonstrates a moderate relationship (determined by moderate to high quality studies) between precompetition injuries and an increased chance of failure in track and field1 and Australian football.30 While plausible, it should be noted that there is limited evidence that avoiding injury increases the chance of success. A stated threshold of >80% reported in one track and field study1 illustrated a potential sevenfold increase in the chance of achieving an individual’s goal once exceeded. While no association between precompetition injuries and failure was observed for taekwondo,29 this result must be interpreted with caution due to the lower methodological quality and the very high prevalence of injury in this study cohort. Unsurprisingly, injuries sustained during competition reduced the chance of athletic success. A moderate negative relationship was demonstrated in moderate to high quality studies indicating that sustaining an injury during the competition/game increases the chance of failure. Additionally, precompetition injuries are a risk factor for in-competition injuries.33 34 Precompetition injuries are a risk factor for in-competition injuries and may contribute to the result of evidence for precompetition injuries reducing the chance of success. In football, it appears that a team may be able to absorb the effect of one injury during a game; however, sustaining two or more significantly reduces the chance of winning.24 No relationship between in-competition injuries and success/failure was observed in a case study of a single team of subelite rugby league players28 across a single season. Inherently linked to player availability are the results of injury incidence and burden. Injury incidence was investigated in five studies across source populations of professional football,23 25 junior ice hockey,31 subelite rugby league28 and elite track and field.1 Two studies24 30 demonstrated no association. However, these were lower levels of evidence (case studies, level 4) compared with the three studies that reported a significant result (cohort and case–control studies, levels 2 and 3).1 23 31 The difference in results may also be related to the numbers of participants/teams assessed with the results of case studies24 30 of a single team insufficiently powered to detect a difference. This is supported by one study reporting a ‘trend’ towards significance.35 Furthermore, both case studies used Pearson’s correlation coefficients which indicate the level of correlation, however, are incapable of informing the risks associated with these rates. Athlete health should be prioritised as a component of the integrated performance system. Multiple stakeholders (eg, clinician, coach, sport scientist, the athlete) are accountable for both performance and the health. Sacrificing an athlete’s safety resulting in injury or illness may also result in lower performance. Performance cannot be researched without consideration of the health status of the athlete both during competition and the period prior. Historically, the focus of injury prevention programmes has been on reducing injury rates without consideration of other aspects of the real-world system. However, our review indicates that preventing injuries (and illnesses) has real-world significance because it may lead to superior performance. Therefore, when attempting to garner support and adherence to the implementation of interventions (and ongoing participation in injury and illness prevention programmes), one way to improve engagement would be to highlight the link between injuries and impaired performance. In practice, this would be undertaken in the initial stages of intervention mapping which involves identifying adopters and implementers38 and ensuring the intervention is ‘fit-for-purpose’ and provides the adopters with the outcome that is sought. In the real-world, performance is likely to feature as one of these priorities. Future research should employ methodological approaches to answer clinically relevant questions related to injury prevention and performance, so that there is quality evidence to guide clinical decision making. The following section details suggestions of improvements in study design, statistical analysis and definitions of injuries and illness that would assist the practical interpretation of future studies. The results presented in this review must be interpreted with respect to the level and quality of evidence. For example, of the 14 included studies, seven1–3 21 26 27 31 were low risk of bias with all but one study reporting a significant association.21 No association was observed with injury incidence in two studies.6 17 However, these were only level 4 evidence. The studies that reported a significant result were higher levels of evidence (levels 2 and 3).1 23 31 Similarly, the level of evidence for the relationship of in-competition injuries and success was low—one study reported no association and was of level 4 evidence.25 We recommend that future research investigating this relationship employ a prospective cohort design and ensure complete reporting of methodological parameters, so that the evidence can be interpreted by comparison with the current available evidence. Our review highlights that any significant relationships are unlikely to be found in single-club case studies and this is most likely due to lower statistical power. Therefore, future research should include multiple seasons across more than one club (or equivalent) in team sports and across multiple seasons in individual sports such as athletics. Only two of the evaluated studies1 31 in this review employed risk statistics considered to be relevant measures for cohort studies. Odds ratios overestimate the risk when the prevalence of the outcome of interest is greater than 10%.39 Given that the chance of winning/losing matches in team sports is 50% (assuming the teams are equally matched), relative risks should be employed so that the effect of the results are not inflated.39 Relative risk is the preferred estimate over OR for prospective investigations.39 Poisson regression with robust error can produce these relative risk estimates39; however, we advise future authors to determine and use the most appropriate statistics for the study design and research question. Given the fact that each athlete and/or team is being evaluated repeatedly, the data should be declared as panel (time-series) data and handled in such a manner accounting for within team/individual variances, for example, as a random effect within mixed modelling or generalised estimating equations methods. Correlation statistics are unable to inform practitioners, coaches and policy makers of risks and benefits, and should not be the primary analysis method used in future studies. As expected, the definition of success was dependent on the sport investigated. Online supplementary material 3 summarises these definitions. However, they can be broadly categorised as: (1) match/game/competition win or loss, (2) achieving personal goals during a season, (3) number of games won in the season, (4) final league standing, (5) number of goals/points/tries scored, (6) subjective coach rating and (7) game statistics such as completion of attacking sets of tackles in rugby league. Future research should clearly outline the definition of success or failure and investigate both outcomes. It is possible for an athlete to remain injury-free yet still fail. For example, an athlete may be outmatched by a stronger opponent or environmental factors such as the weather may influence the outcome. A strength of this review is that all definitions (see online supplementary material 3) were mapped to the IDCF classifications,15 which allows comparisons of studies using similar definitions. We recommend that future research use the IDCF classifications to map definitions. This would facilitate comparison of results of different studies. Additionally, only two studies1 26 in our review evaluated the effect of illness on success/failure. Both were of high methodological quality and demonstrated the negative impact of illness on achieving performance goals1 and percentage of games won.26 Given this relationship, we recommend that future research investigate the effect of illness on athletic success. Clinically, practitioners collecting surveillance data should ensure that their data contain availability rates, in-season and preseason incidence, burden (accumulated time loss) and squad utilisation if they wish to investigate the influence of injury/illness on performance outcomes. Our review oversimplifies success and failure. In the complex, real-world sporting environment, a binary definition of success and failure is unlikely to be wholly realistic with many factors influencing what is perceived as success or failure. Perception of success may be related to the role held within the team—performance director, coach, medical support, sports scientist, fan or the athletes themselves. Firm conclusions regarding the relationship between illness and success/failure could not be made using the existing literature, with only two studies investigating this relationship. While nine sports were investigated, the heterogeneity of definitions and study designs limited our ability to synthesise evidence both within and across sports. The evidence was therefore only synthesised according to the predetermined definitions of success/failure. Injuries and illnesses have the potential to increase the chance of failure in athletic populations. Injuries detrimentally affect the final ranking position with higher availability rates associated with better outcomes. Injuries and illnesses sustained during competition affect the outcome of success and failure in team and individual sports. Injuries detrimentally affect the final ranking position in team sports. In-competition injuries affect the outcome of success. Higher availability rates in team sports are associated with better success throughout the season. How might this review impact on clinical practice in the near future? Injury and illness prevention strategies must be a focus for a success-driven athlete or team. Injuries and illness can impair success both within a single game or event and throughout a competitive season and must be considered in training and competition planning processes.
. Cost-benefit analysis underlies training decisions in elite sport. Br J Sports Med 2016 (Published Online First).
. Systems Thinking and Team Performance analysis. Int Sport Coach J 2016;3:184–91.
. Preferred reporting items for systematic reviews and meta-analyses: the PRISMA statement. Ann Intern Med 2009;151:264–9. The Oxford 2011 levels of evidence. Oxford, UK: Oxford Centre for Evidence-Based Medicine, 2016. http://www.cebm.net/index.aspx?o=5653. (accessed 13 Jul 2016).
. Squad management, injury and match performance in a professional soccer team over a championship-winning season. Eur J Sports Sci 2015;15:573–82.
. Influence of injuries on team playing performance in Rugby League. J Sci Med Sport 2004;7:340–6.
. Precompetition injury and subsequent tournament performance in full-contact taekwondo. Br J Sports Med 1995;29:258–62. Contributors MD, PC and BR contributed to the original concept. PC and MD designed the search strategy which PC executed. MD and PC determined eligibility criteria and undertook the process of inclusion/exclusion. PC and BR independently assessed methodological criteria with MD providing the decision where consensus was not met. MD extracted all data from the included studies and PC confirmed the accuracy of this. All authors contributed to the drafting and final approval of the manuscript.